The story I took out of the newspaper and I only changed the words. It’s, er… ..Well, I changed, er… the reporters view into… I used it I used it for something I wanted to say, er, and I used his view, the Maryland reporters view to get at what I wanted to say and turn it that way. And I used a true story, that’s all. I could have used a made-up story. 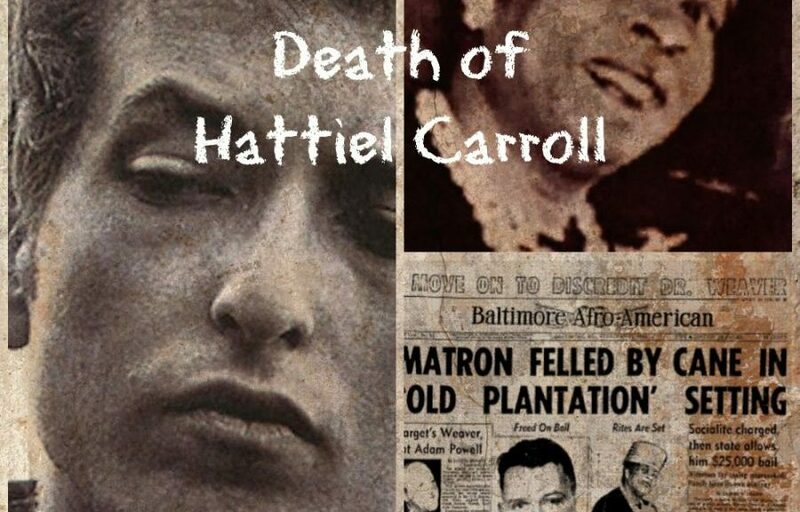 “The Lonesome Death of Hattie Carroll” is an extremely moving song that has stood the test of time better than any of Dylan’s other early topical songs of this sort (retellings of real events, usually tragedies, usually with a moral attached or implicit). Dylan sings it from the heart; he really cares about the woman who died-her dignity and the value of her life come through in the song, it is a memorial to her and a tribute to people like her as much as it is an attack on her killer and people like him and the system that coddles them.